How about a little #TBT with Jay Bruce, former right fielder for your Cincinnati Reds? The Cincy fan favorite was traded to the Mets in 2016, then to Cleveland in 2017. He returned to the Mets in 2018, who then traded him again to Seattle. For some reason, I don’t think the Mets really want the guy. 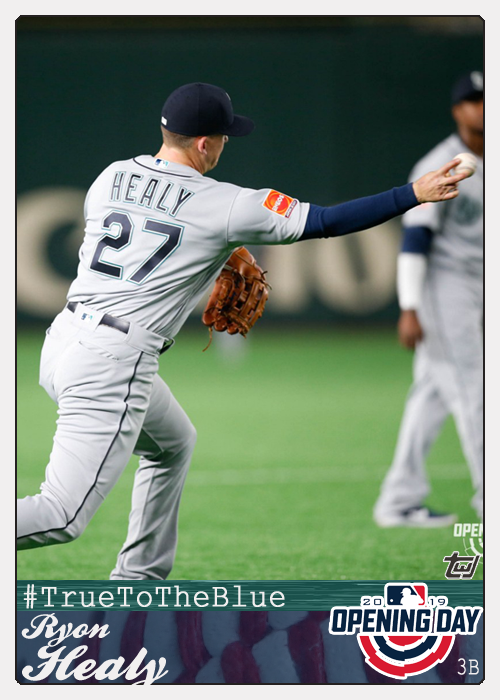 The Mariners have been using him quite a bit at first base so far this season, which is really cool to see. I remember when Joey Votto was hurt several years ago, Bruce volunteered to play first even though he hadn’t been there since high school. That’s called putting the team first. 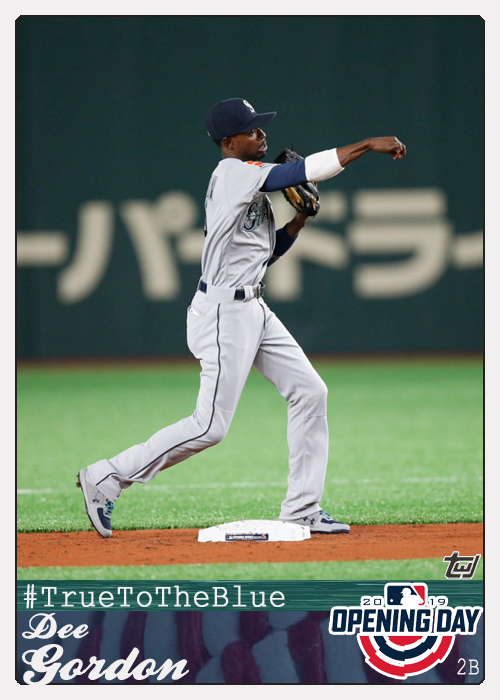 It would look a lot like the 1987 Donruss “Opening Day” set. Not design-wise, but concept-wise. It would feature only the starters from Opening Day, perhaps the manager or mascot as well. It would (if possible) feature photos from Opening Day. 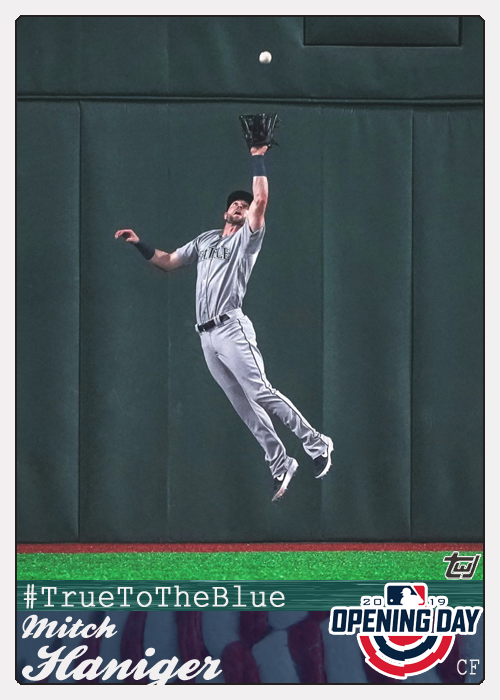 I would definitely avoid using the same photo as used in the flagship set. 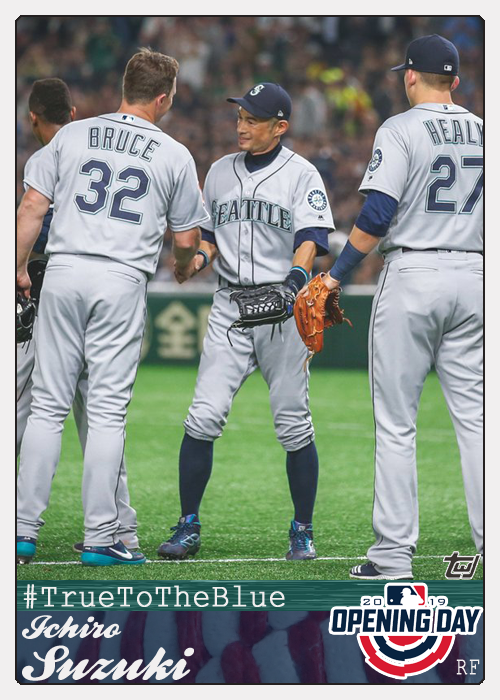 Thirty teams, ten cards per team…a nice 300-card set featuring the starting lineup for each team. 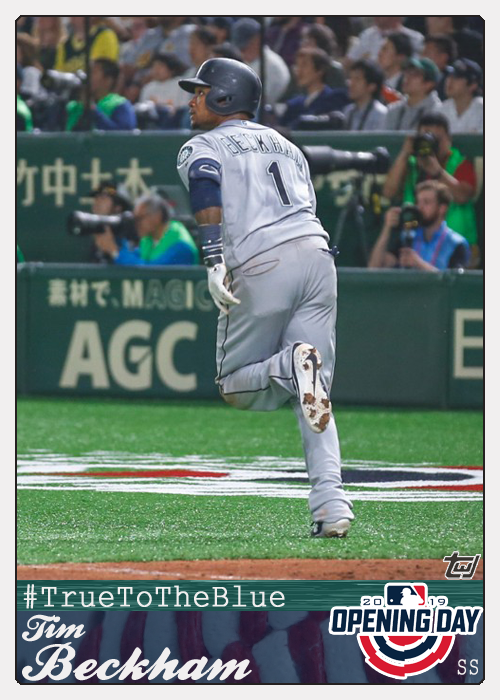 The Mariners and A’s played the first game of the 2019 season early Wednesday morning in Japan. Well, it wasn’t early in Japan, but it was early here in the States. 5:30 a.m. Eastern time. I was able to watch the first inning and a half before my shift at work ended. 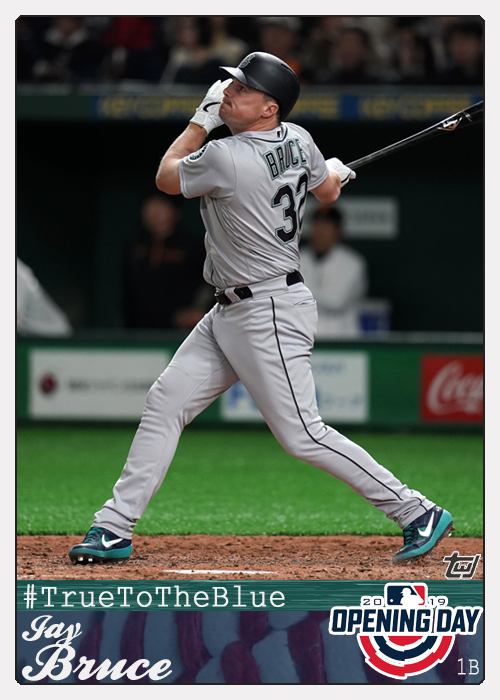 The Mariners Blog posted a bunch of fantastic photos, and I converted several of them into “fun cards.” The only player omitted from that post was Jay Bruce, but I was able to find a photo for him from an exhibition game played earlier in Japan. 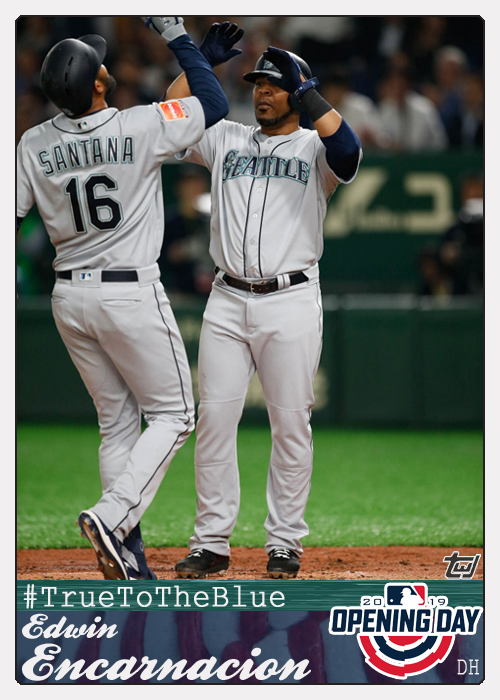 The Mariners starting lineup was Bruce (1B), Dee Gordon (2B), Ryon Healy (3B), Tim Beckham (SS), Ichiro Suzuki (RF), Mitch Haniger (CF), Domingo Santana (LF), Omar Narvaez (C), Marco Gonzalez (P), and Edwin Encarnacion (DH). 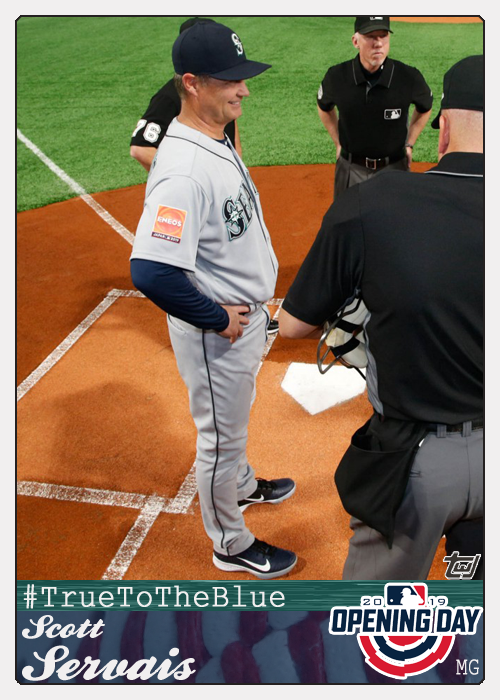 Scott Servais is the manager. It was not as easy finding photos on the A’s side. I’m sure there is a good blog that posted nice photos, but I didn’t spend a lot of time searching. I did find enough from the game on Twitter and Google to make five players and the manager. 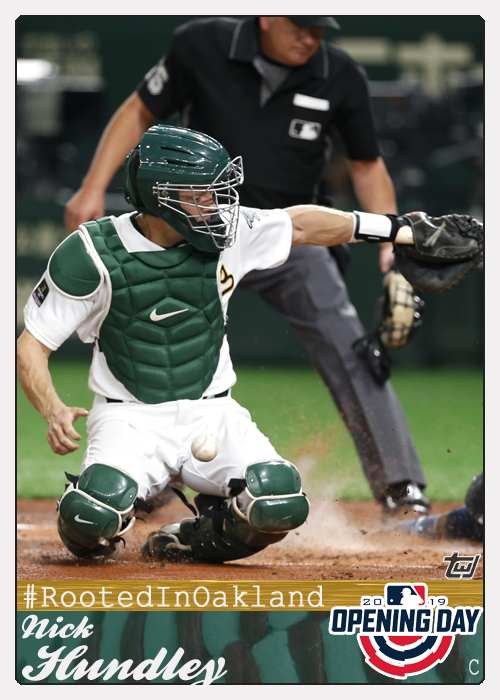 The A’s starting lineup was Matt Olson (1B), Jurickson Profar (2B), Matt Chapman (3B), Marcus Semien (SS), Stephen Piscotty (RF), Ramon Laureano (CF), Chad Pinder (LF), Nick Hundley (C), Mike Fiers (P), and Khris Davis (DH). 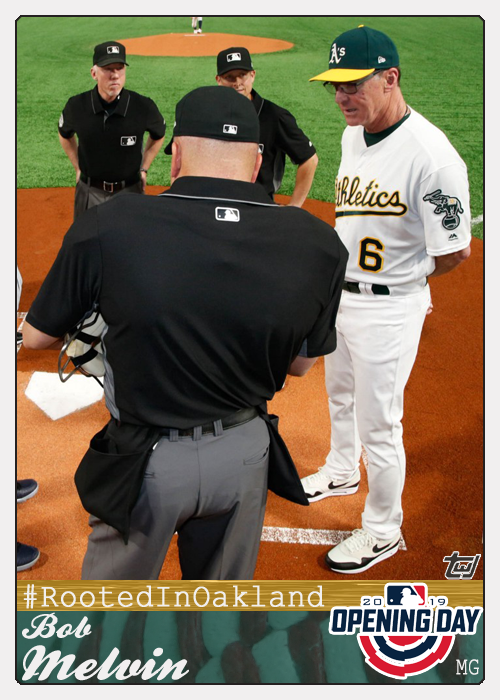 They are managed by Bob Melvin. 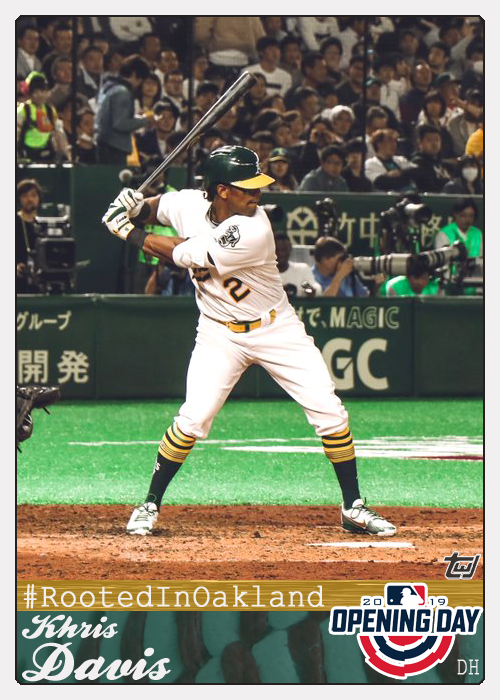 This design has a definite 2007 Fleer flavor to them. Not what I was going for, but I don’t hate it. It may be a little too similar to other designs I have made in the past though. I plan to make a few of these for the Reds as I find good photos from Opening Day. If other teams post some good pics on Twitter, I may do a few non-Reds as well. Is there anyone you would like to see in this design (assuming, of course, they are in the starting lineup next Thursday)? When looking for a Hall of Famer to represent the Diamondbacks, it’s slim pickings. 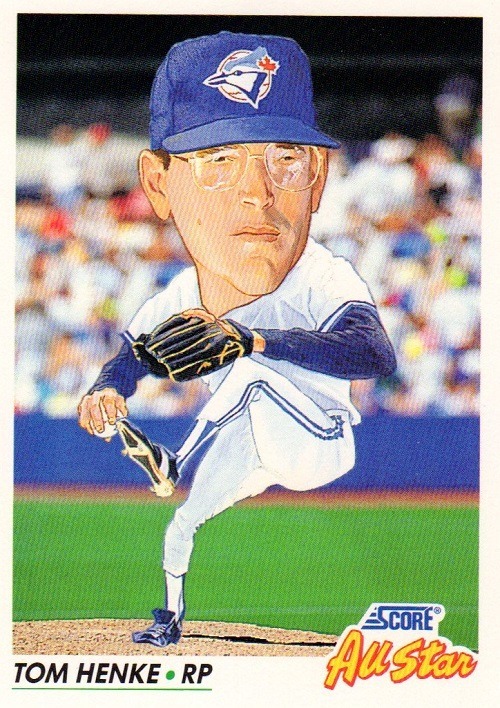 Roberto Alomar played all of 38 games there, which doesn’t necessarily disqualify him, but I just wasn’t feeling it. Then there is Alan Trammell, who was a coach from 2010 to 2014 and managed the final three games in 2014 after Kirk Gibson was fired. 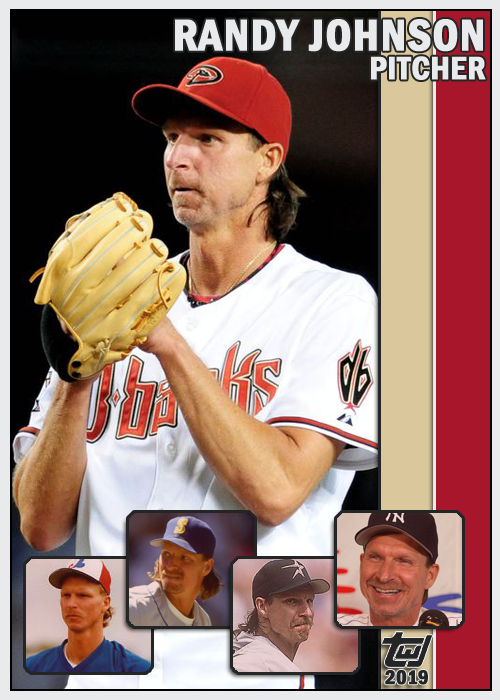 The only guy left is Randy Johnson, and he ain’t no slouch. He is the only Hall of Famer so far sporting an Arizona cap on his plaque. Will Curt Schilling join him when (not if) he is finally inducted? 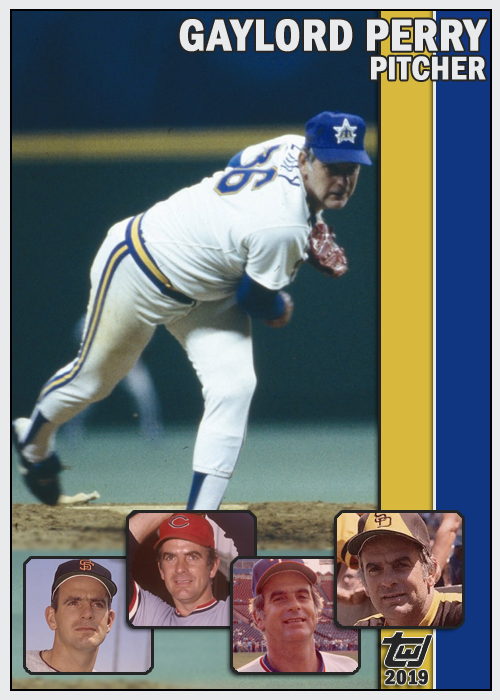 Gaylord Perry was a much better pitcher than people remember. Yes, he used the spitball, but does anyone really care about that? 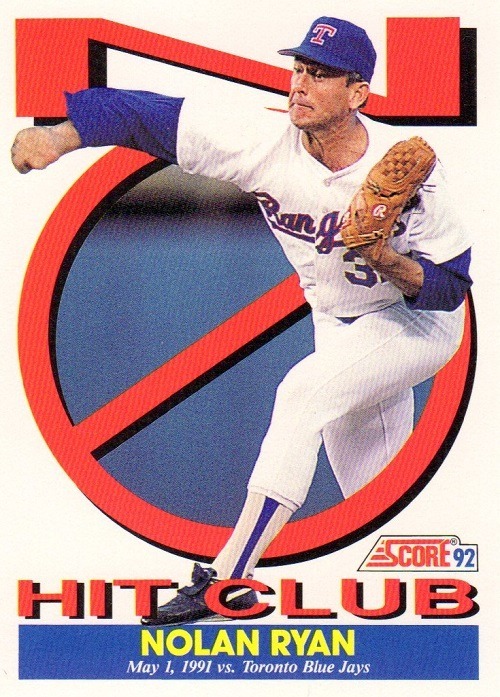 300 wins, 3500 strikeouts, and the 13th highest career WAR for pitchers. If my math is correct, at the time of his retirement, he was 8th all-time. Since then, he has been passed by Roger Clemens, Greg Maddux, Randy Johnson, Phil Niekro, and Bert Blyleven. P.S. The Mariners really need to bring back the trident as their primary logo. So much more character and charm than the current borefest they wear. 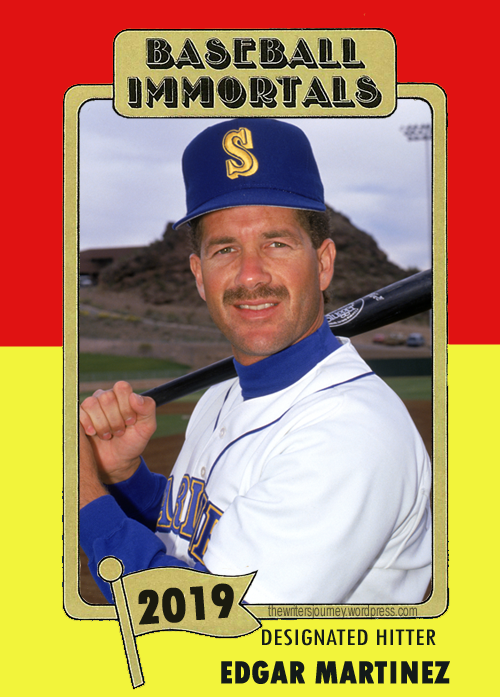 Finally, the long wait is over for Edgar Martinez. In his tenth and final year of eligibility on the BBWAA ballot, the standard by which designated hitters are judged gained entrance into the National Baseball Hall of Fame. Since the modern era began (1961), only three players have bettered his .418 OBP. After a sluggish start on the ballot, Edgar’s candidacy gained traction three years ago and he received 70.4% of the vote in 2018. 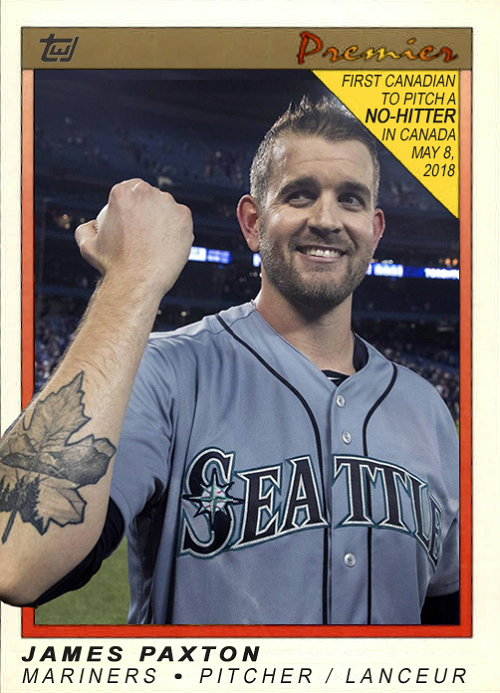 James Paxton made history last night as the first Canadian-born pitcher to throw a no-hitter in Canada. The Mariners pitcher struck out seven Blue Jays batters while Seattle’s defense stepped up, making several spectacular plays to preserve the no-no. Seems like it should be something O-Pee-Chee for Big Maple. 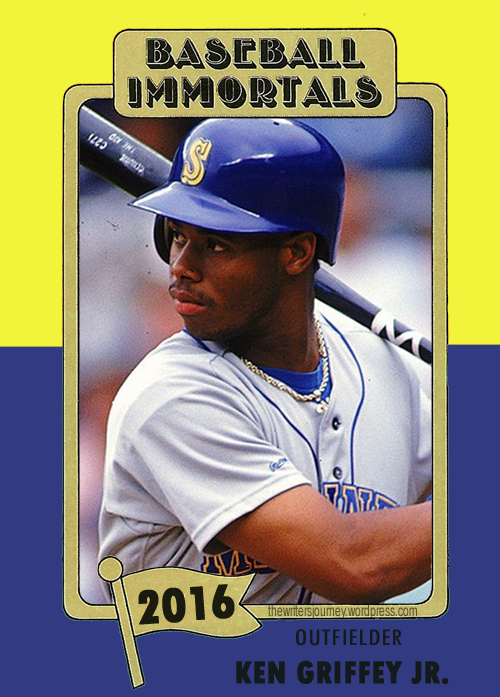 Fun Cards: “Baseball Immortals” Ken Griffey Jr. The Kid. Need I say more? Ken Griffey came within three votes of being the first unanimous selection for the Hall of Fame. I’m not sure if anyone will ever get every vote. 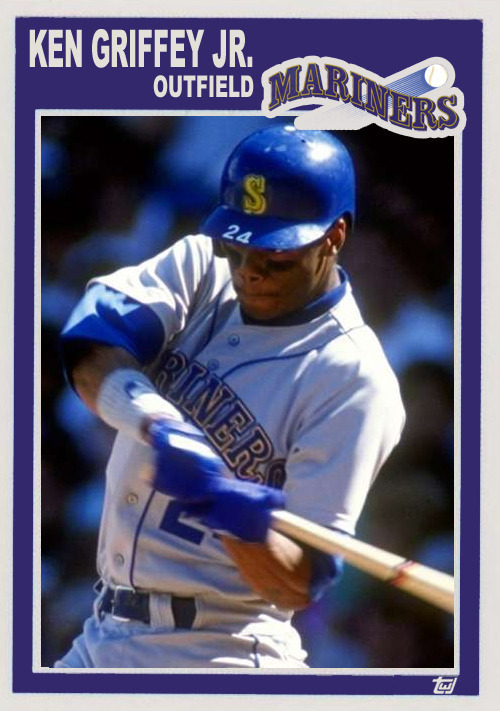 Of course, Griffey is best known for his time in Seattle. He was an absolute monster in his first eleven years, and everyone knew he was on his way to Cooperstown. 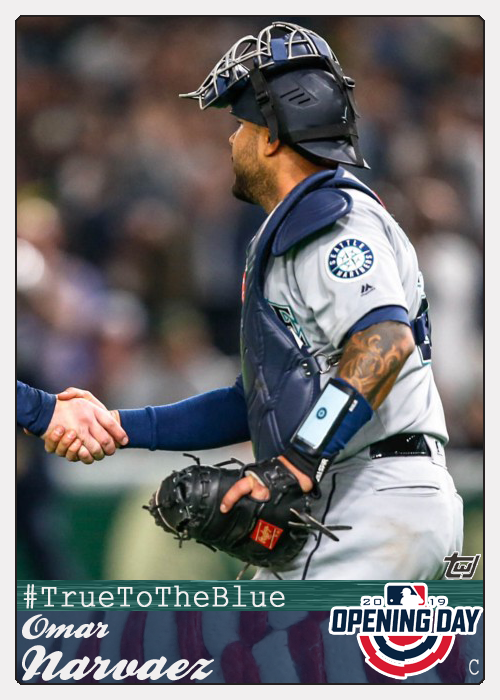 The Mariners shocked the world when they traded him to Cincinnati. As a Reds fan, I was stoked, and I’m glad I got to see him play in person on several occasions. 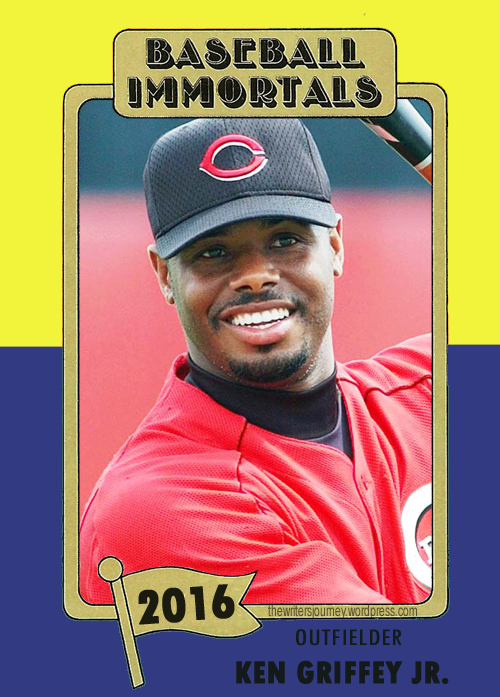 After nearly nine years in Cincinnati, Reds fans turned on Griffey (as Reds fans always turn on their heroes, sadly). The Chicago White Sox decided to add the legend to their roster for the remainder of the 2008 season. It’s always strange to see him in a Chicago uniform. Griffey returned to Seattle for one last hurrah, finally retiring in June, 2010. 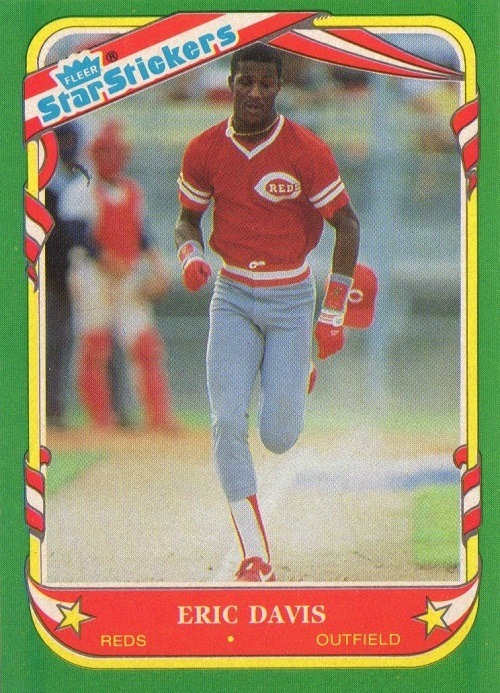 First up is Eric Davis from the 1987 Fleer Star Stickers set. 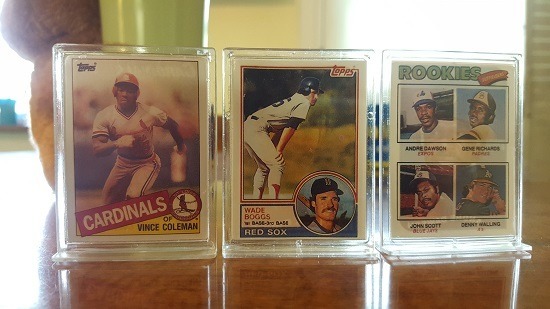 These cards are very similar to the 1986 set, but with a green border instead of maroon. Either way, the border clashes with the red jersey. 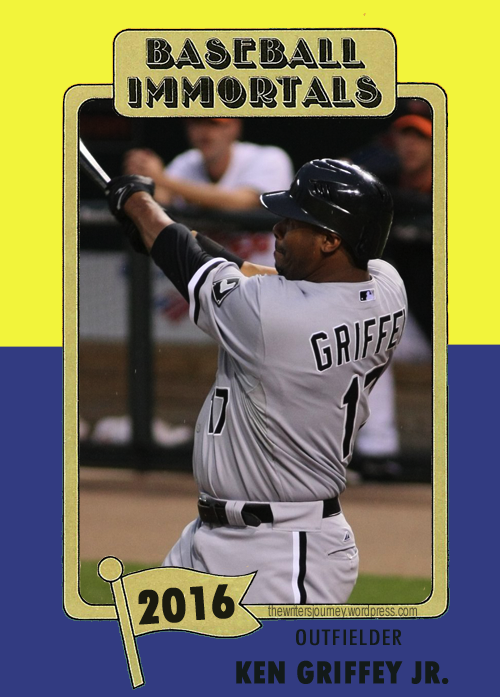 The 1988 Fleer Star Stickers went with a gray border sprinkled with colorful stars. 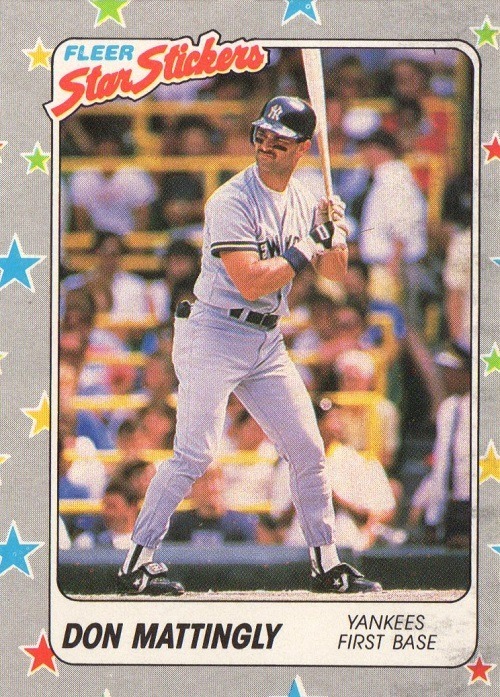 This Don Mattingly is the best card I pulled from that pack. 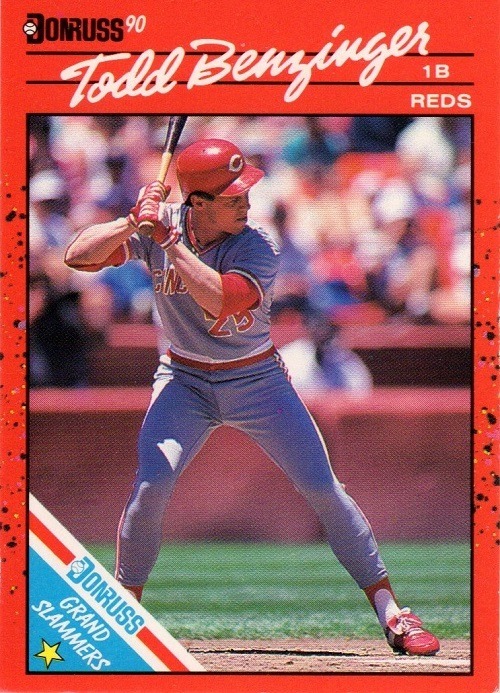 Back to 1987, and a pair of Reds in a pack: the best centerfielder and the best relief pitcher of the second half of the decade. John Franco is criminally underrated. 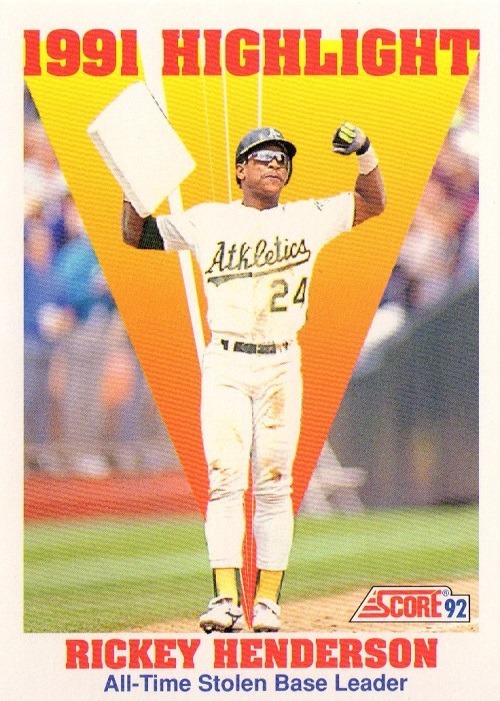 I bought a couple of packs of 1990 Donruss. Don’t look at me like that. 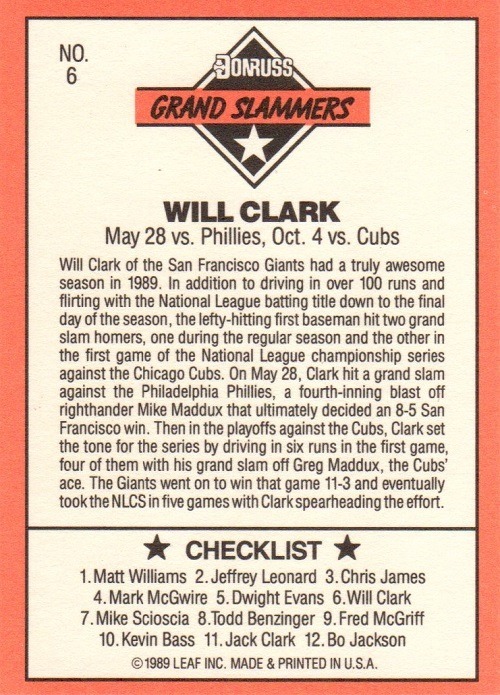 I did not have any Grand Slammers cards, and I wanted a couple. 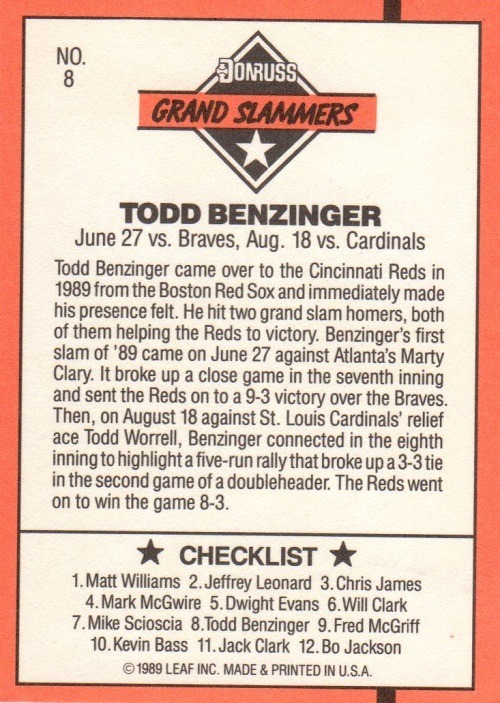 I pulled the Todd Benzinger from one pack, and Will Clark from another. 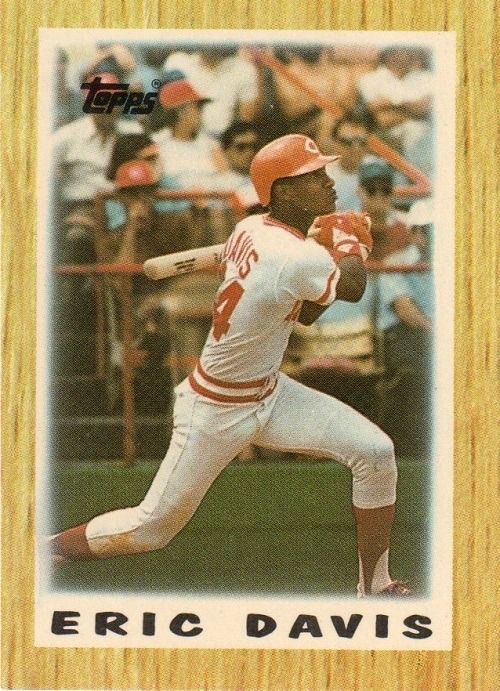 If I had found another pack with Bo Jackson on top, I would have bought that one too. 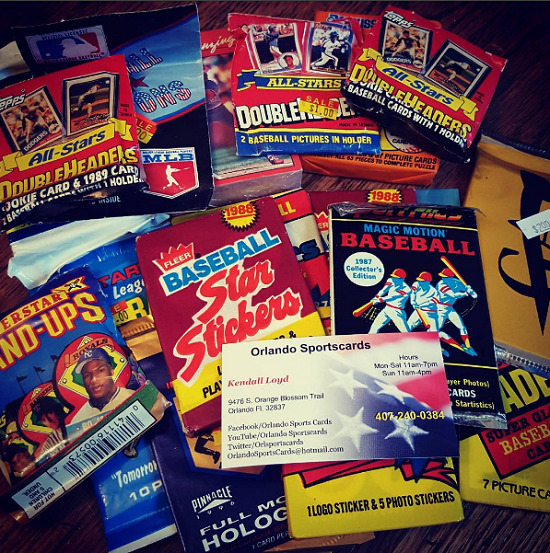 I did not know the 1992 Fleer “The Performer” cards came in packs of their own. I assumed they were inserts. 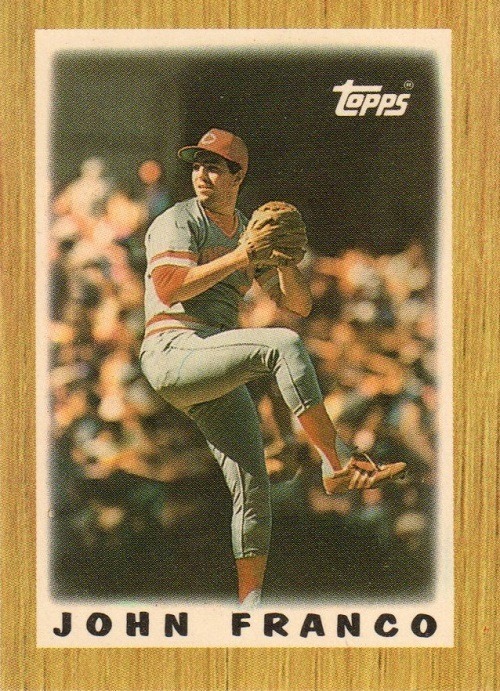 In a five-card pack, I pulled Nolan Ryan and Frank Thomas. And probably some ‘roiders, I can’t remember now. Art cards will always be my weakness. 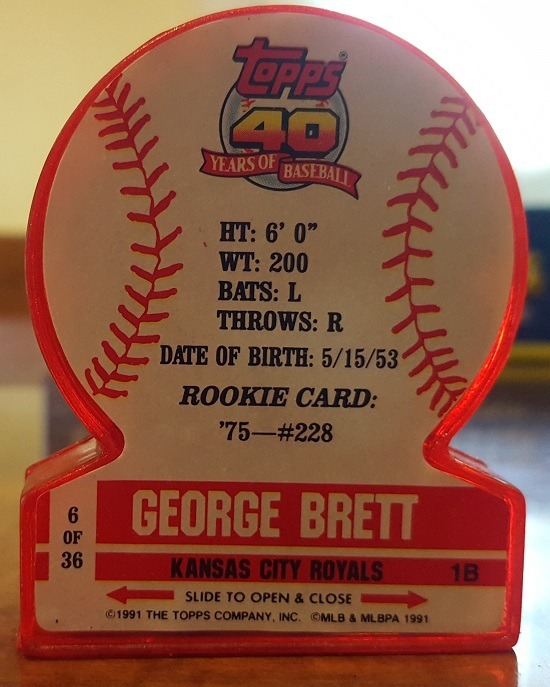 I’m not sure why I picked up a pack of 1992 Score, but I was happy to pull these bad boys. Also from the same 1992 Score pack. There it is. I knew there had to be something cool showing on the top of a 1992 Score pack for me to buy it, even at only fifty cents. Jim Thome is the man. 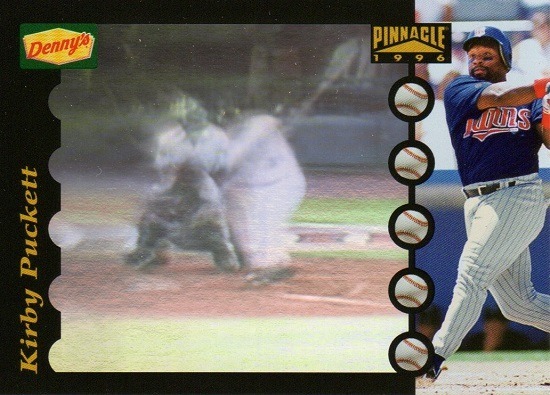 Kirby Puckett from 1996 Pinnacle Denny’s. Not sure why I bought this one-card pack. Oh well, at least it’s a Hall of Famer. I have always wanted some Double Headers, but have never seen them in person. 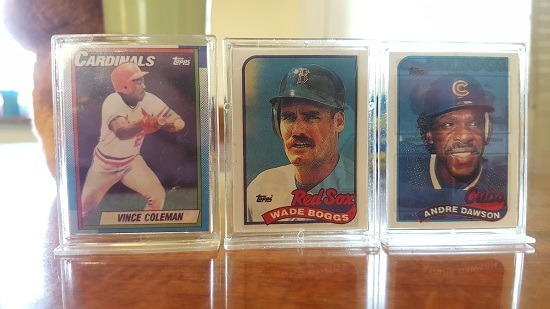 Vince Coleman is from 1990, while Wade Boggs and Andre Dawson are from 1989. Think this candy is still good from 1991? 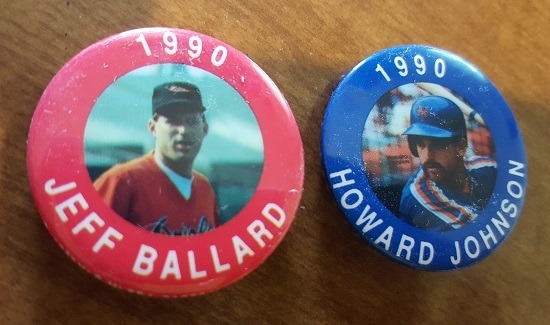 Finally, a couple of 1990 Baseball Buttons. I already have several of these, so I probably shouldn’t have bought them, but it was only fifty cents. Being the son of a major leaguer must be daunting, with athletic expectations high. Being a third-generation ballplayer, especially when no one ever followed both their father and grandfather into the professional ranks before, the pressure had to be immense. 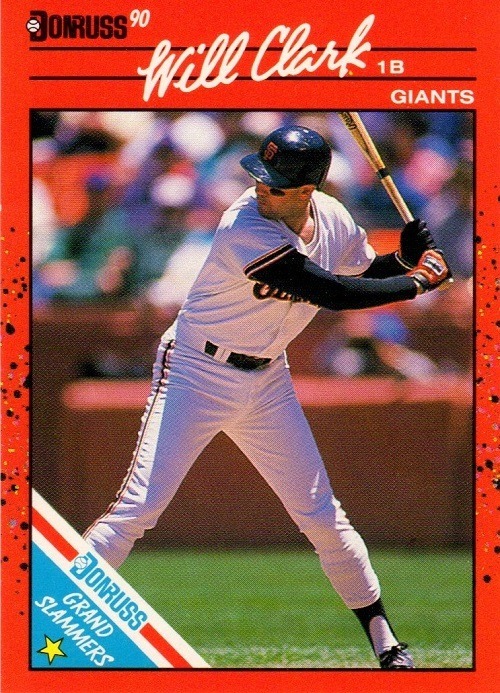 But not for Bret Boone, who was not satisfied to have a famous last name. He wanted to prove that he belonged, and not just a feel-good story for the media. In Home Game, Boone admits that he regrets the way he approached his big league debut. 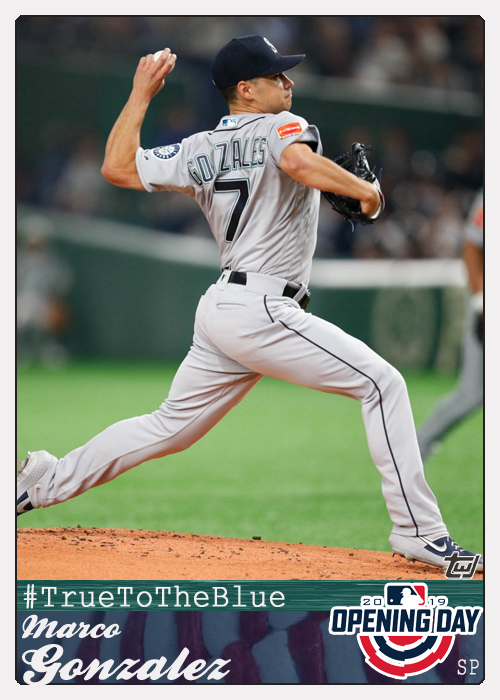 He should have given more credit to his grandfather, Ray Boone, and father, Bob Boone, both who had solid careers. Ray led the league in RBI and was an All-Star; Bob showed him up by becoming one of the greatest defensive catchers in the game and making multiple All-Star Games. 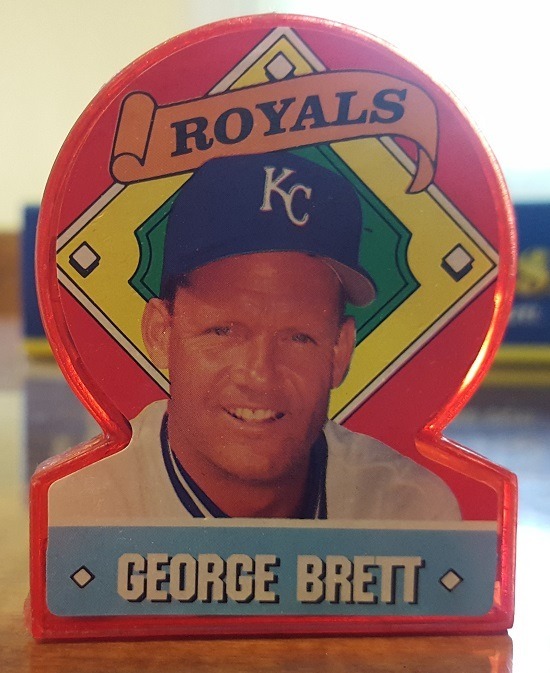 Bret carried on the tradition of family excellence, leading the league in RBI like his grandfather and becoming a stalwart defensive second baseman and All-Star in his own right. And he was not alone; he was joined by his brother Aaron Boone at the top level of professional baseball. Boone honors his heritage, showing respect to his late grandfather and his father, relating a handful of stories that were passed down to him. He tells about growing up in the Phillies clubhouse, getting batting tips from Mike Schmidt, and later, when his dad was with the Angels, playing catch with Reggie Jackson. He discusses his disappointment in being drafted so low out of high school, and in not being drafted until the fifth round after a few years at USC. He recalls his time in the minor leagues and his struggle to get to Seattle, where he butted heads with Lou Piniella at first. 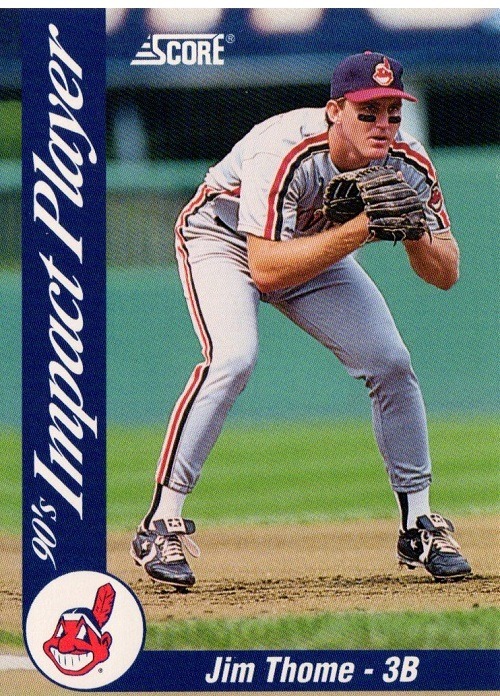 He also tells of the hazing he endured from Jay Buhner, and the friendship that developed as he handled it in stride. There is some foul language throughout—not as much as some autobiographies contain, but it is present. Home Game: Big-League Stories from My Life in Baseball’s First Family is a good behind-the-scenes look at the game, covering three generations of All-Star baseball. 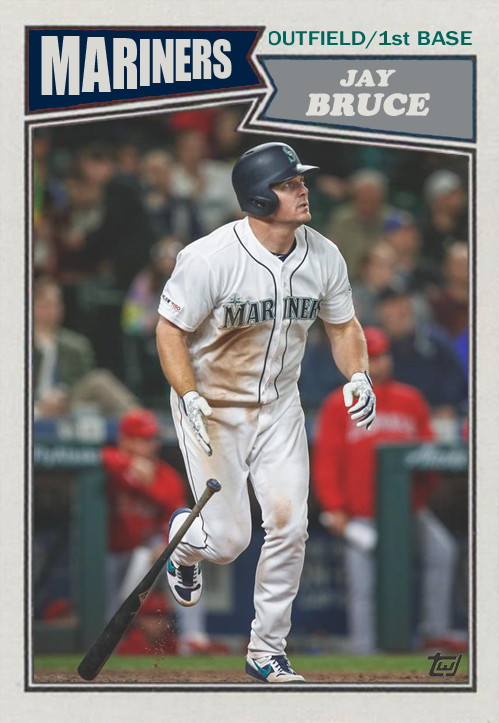 Aside from the Boones, there is mention of Ted Williams, Pete Rose, Warren Spahn, Steve Carlton, Ken Griffey, and Barry Larkin, among others. It may be some time before we see another three-generational All-Star family, and this peek inside the family tradition of the Boones is well worth the read. Learn more about Crown Archetype. 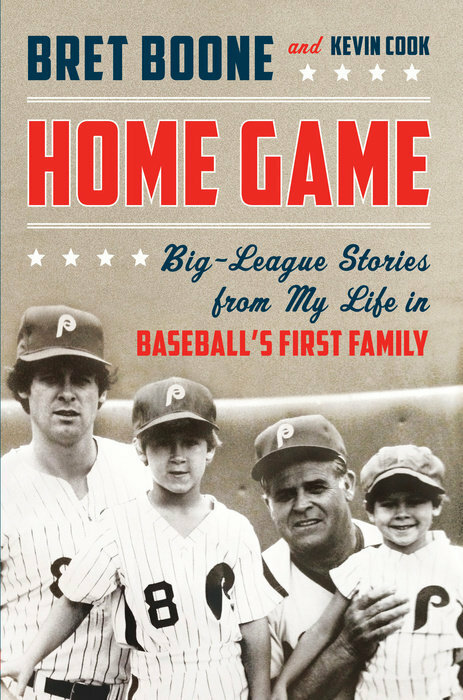 Purchase Home Game: Big-League Stories from My Life in Baseball’s First Family by Bret Book and Kevin Cook. The 2016 Hall of Fame inductees were announced last night, and neither name was a surprise. The legendary centerfielder Ken Griffey Jr. and slugging catcher Mike Piazza will be enshrined as baseball immortals this summer in Cooperstown, New York. 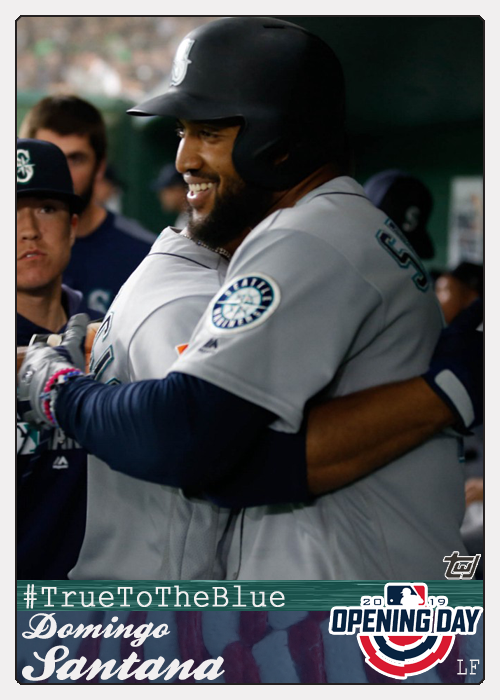 I decided to create a couple of “fun cards” to commemorate the newest legends, but I wanted to go back to their rookie years. 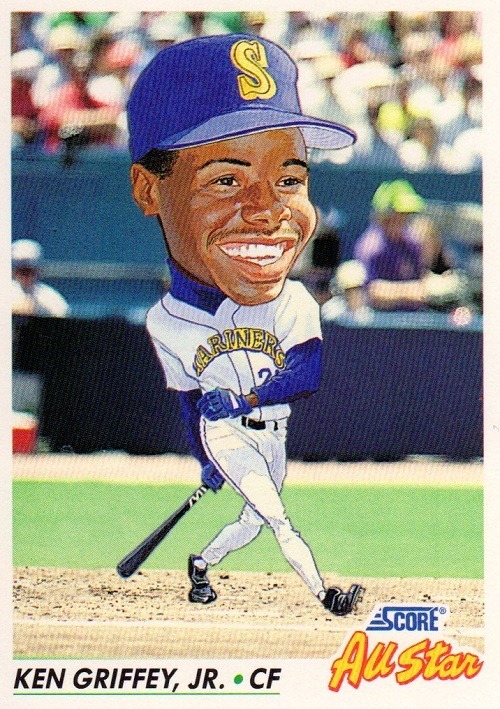 Griffey, a #1 overall draft pick for the Mariners in 1987, debuted in the big leagues in 1989. 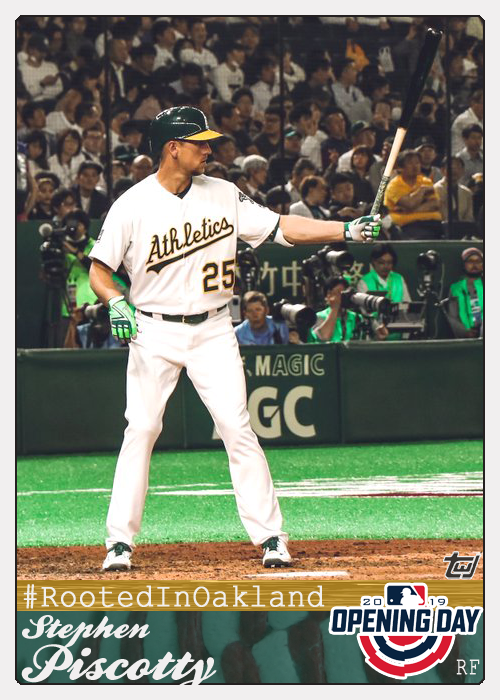 He was included in all the major sets, either in the base set or the year-end updates: Bowman, Donruss, Fleer, Score, Topps, and Upper Deck. So I had to think outside the box, and decided to borrow a design from Fleer’s basketball release in 1989. Piazza was a bit easier when it came to the design. 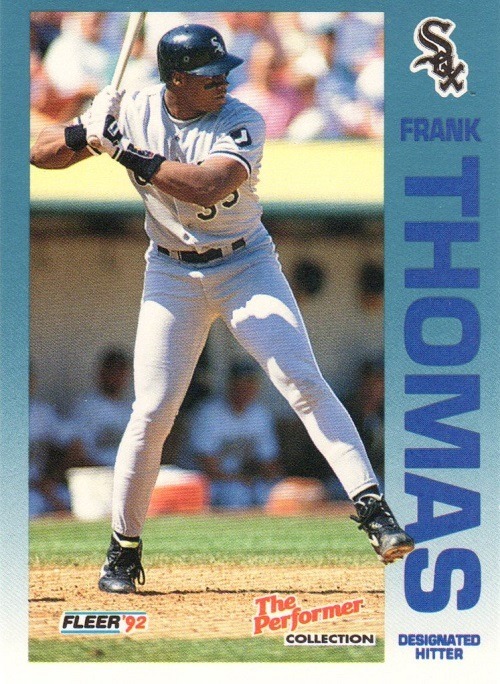 While he was featured in the Bowman set, Fleer was the only other company that saw fit to include him in their year-end set. After all, what type of impact could a 62nd-round catcher possibly have in baseball? 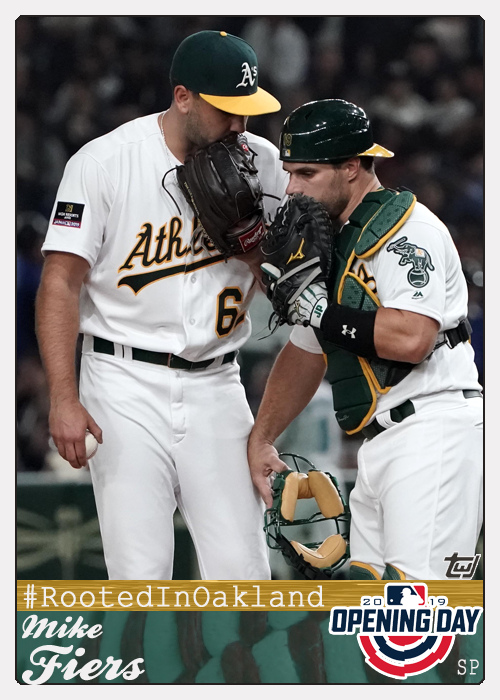 Topps and Upper Deck completely ignored Piazza, while Donruss saw fit to include him in an insert set, but not the base. 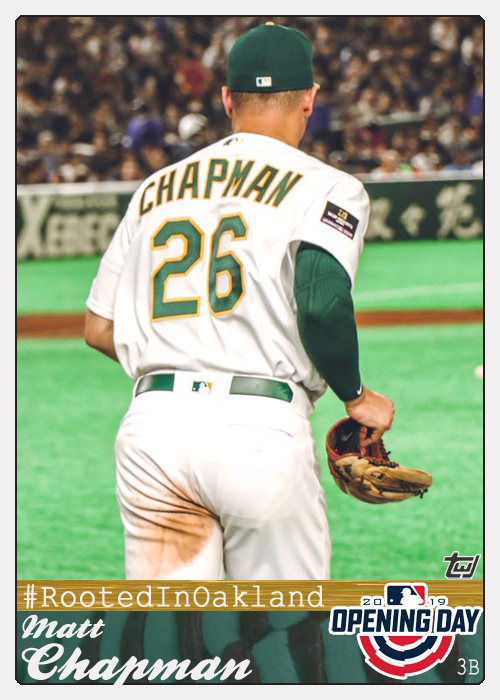 As I am a bigger fan of Topps than any of the others (at least when it comes to the 1992 design), I decided to make a Topps card-that-should-have-been for him. 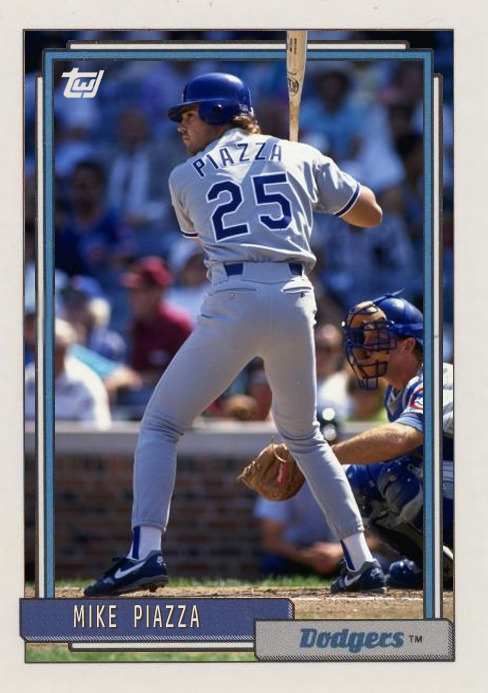 However, in 1992, Piazza wore uniform #25 rather than #31, so it was a bit tricky tracking down an era-appropriate photo. I’m happy with the way these turned out, and I’m happy to see these players getting their just due. Griffey, three votes short of a unanimous selection, and Piazza, who had to wait until his fourth year of eligibility, are true examples of baseball done right. NEW 2016 edition: featuring “Gone” and “Murder at the Junkyard” by Jason T. Carter. 2015 edition: featuring “Red & White Stripes” by Jason T. Carter. 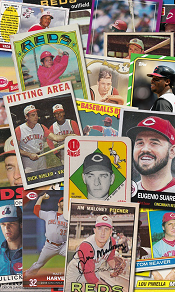 Click here to see my Cincinnati Reds checklists and wantlists! The Writer’s Journey covers a wide variety of topics, from sports to movies to music to toys and games. Basically, anything that interests me is fair game on TWJ. I am the editor, so what I say goes!